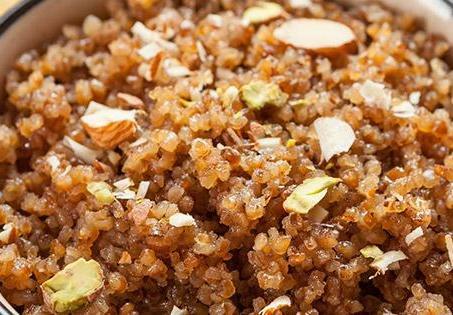 Lapsi is one of the most well-known of Gujarati desserts, Lapsi is a very appealing sweet dish of roasted and cooked broken wheat sweetened with Jaggery (gur). 1) Heat ghee in a non-stick pan. Add broken wheat and sauté for 5 minutes or till browned. 2) Boil 4 cups water and add this to the pan, cover and cook till the water evaporates. 3) Add cardamom powder and fennel seeds and mix well. Add jaggery, mix well and cook for 2-3 minutes or till the 4) 4) Serve warm.